The appendix is a small, tube-like organ that hangs from the large intestine. 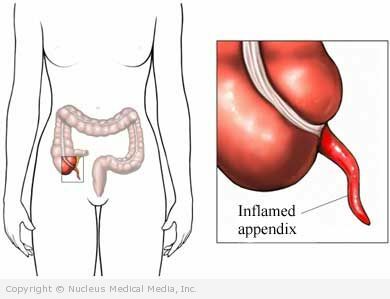 Appendicitis is inflammation of the appendix. The appendix has no known function. The lining of the appendix continues to produce mucus. It has no place to go. Bacteria normally found in the intestines build up and make toxins in the lining of the appendix. Pressure builds and causes severe pain in the abdomen. The wall of the appendix can break open. The contents of a ruptured appendix can spill into the abdominal cavity. This causes serious redness and swelling. This is called peritonitis. It can be fatal. Note: Symptoms may be different in infants, children, pregnant women, and the elderly. Get medical help right away if you have severe pain in the abdomen. Appendicitis can be hard to diagnose. Symptoms vary and can be similar to symptoms of other diseases. Appendicitis is treated by surgically removing the appendix as soon as possible. Sometimes the diagnosis is not certain. The doctor will carefully monitor your condition for 6-12 hours before operating. You will also be given antibiotics to fight infection. Follow your doctor’s instructions if you are diagnosed with appendicitis. There are no guidelines to prevent appendicitis. It starts quickly and the cause is usually unknown. Get medical care right away for severe abdominal pain. It will decrease the risk of rupture.